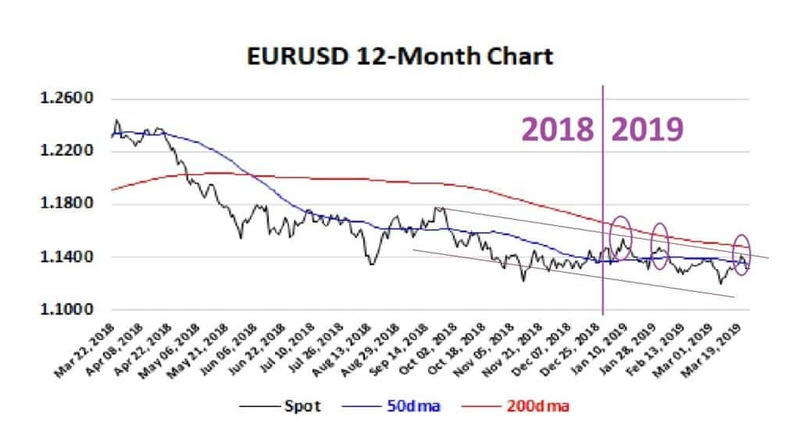 The 200-day moving average (200 DMA) has continued to prove a stubborn barrier to the upward path of EURUSD. This marks the third time in 2019 that the 200 DMA resistance has been challenged and failed. (See the purple ovals in the chart below). This tells one more about the Euro than the Dollar as in a week when the Federal Reserve indicated that it didn’t expect to raise interest rates again this year and the Eurozone is flirting with recession one saw the Dollar end the week sharply lower against the Japanese Yen (USDJPY) but higher against the Euro. So now the EURUSD pair is trading back below the 50 DMA and currently trades with a small rotational range around the 1.1300 line as shown below. This area has been supportive in the past few months and has led to small recoveries, however, what appears to be weighing on the market is whether the EURUSD will move lower again. The technical sentiment is for a bounce in the Euro’s favour in early Monday trade although this will slip back into bearish territory on a weekly and monthly basis. 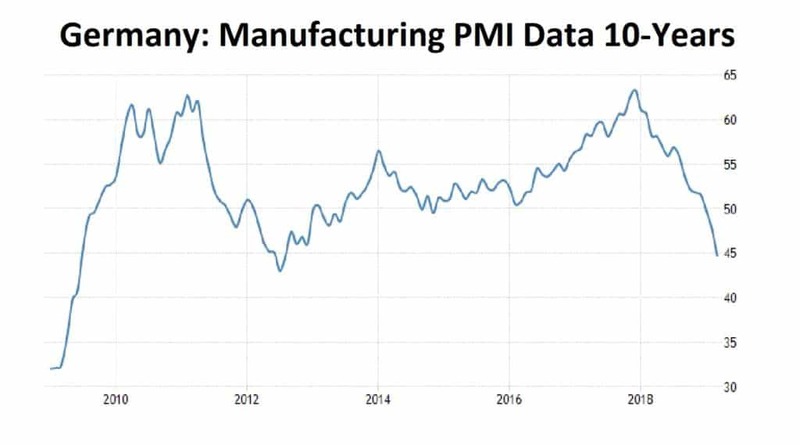 The PMI data was shocking and EURUSD broke 1.1300 quickly after the PMIs fell to multi-year lows, raising concerns that Europe was heading toward a recession. The leading economy tells the story and one can see Germany is hurting with the manufacturing sector contracting for the third month in a row at its fastest pace since August 2012. The IHS Markit Germany Manufacturing PMI plunged to 44.7 in March 2019 from 47.6 in the previous month and well below market expectations of 48, a preliminary estimate showed. The latest reading pointed to the steepest pace of contraction in the manufacturing sector since August 2012, as new export orders fell for the seventh month in a row and at the quickest rate for over six-and-half years amid delayed decision-making among clients due to uncertainty, as well as weaker demand in the automotive sector. In addition, backlogs of work declined the most in nearly a decade and employment contracted for the first time in three years. On the price front, factory gate charges rose at the slowest rate since November 2016 and input prices increased the least since mid-2016. Looking ahead, business sentiment fell further into negative territory to the weakest since late-2012. Auto tariffs from the U.S plus the risk of a hard Brexit would be a severe blow to the German auto industry and the supply chain that runs throughout the economy. Technically and fundamentally, 1.10 is still a viable target for the EURUSD pair.